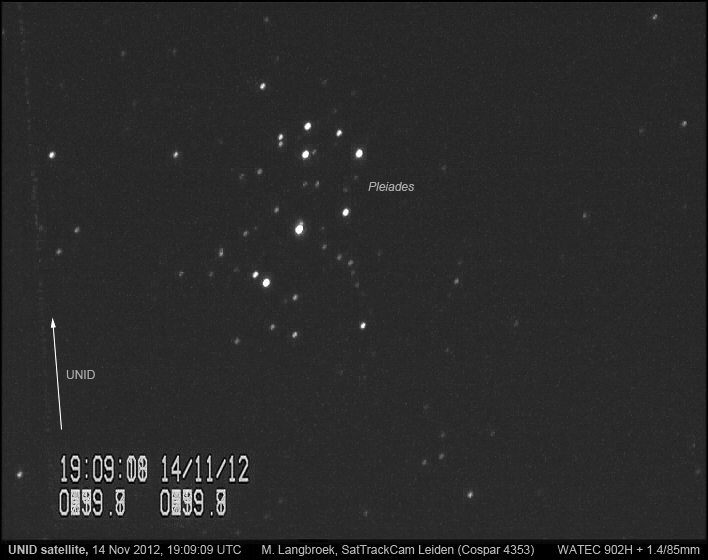 SatTrackCam Leiden (b)log: Is it a bird, or a possible UNID satellite? Yesterday, asteroid (2397) Lappajarvi would occult the mag. +7.8 star HIP 19971 in Taurus. I was some 106 km outside of the predicted occultation zone but inside the 1-sigma uncertainty zone, so I covered the event using my WATEC 902H video camera and SamYang 1.4/85mm lens (no occultation was seen, as expected). I cannot 100% exclude that it is a bird, also because objects in LEO mostly would have been in shadow already at this time of the evening and sky direction (relatively low east). The resulting orbit is moreover retrograde (inclination about 127 degrees), which is very rare among satellites. So maybe it was a bird. It does move very linear (birds usually don't) and doesn't look like other birds I had in view that evening, yet perhaps it was.